Congratulations to "Colleen", the winner of Karlene's giveaway. Thank you to all who participated. G’day! I’m Karlene Blakemore-Mowle and I’m from Australia… is it just me or does that sound like the introduction to some kind of addiction group? Anyway, I also write romantic suspense and I was thrilled to find this blog and see so many others who love this fantastic genre. I have three titles coming out this year- Operation Summer Storm is book one in my Operation series and was released in January. The sequel, book two, Operation Willow Quest was released in February. Then in April, I have Fallout being released. What do all these books have in common? I hear you ask (okay I didn’t but I’m really hoping you are wondering!) well I’m glad you asked! 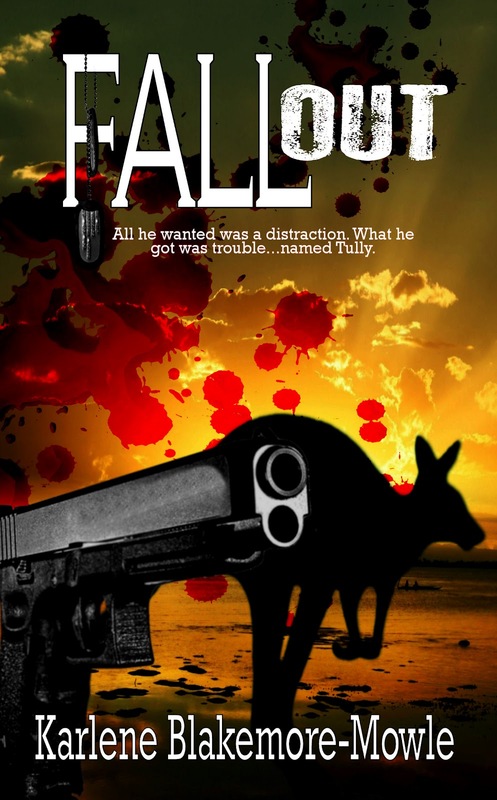 There’s romance of course, and suspense and there’s also a distinctive Australian flavour. Did I mention there were also hot men who know how to serve and protect? And women who are not simpering, delicate, wall flowers. Tully Chambers is no damsel in distress. An up and coming detective, she had her sights set on promotion until the day her partner was murdered and she ended up on the run from the mob. Jake Holden has demons of his own. Having served his country for over twenty years, he’s found himself wounded, alone, and without a plan for his future. What starts as a simple diversion—figuring out the feisty little waitress next door—turns out to be his most dangerous mission yet. From the tropics of Far North Queensland to the rugged interior of Northern Territory in Australia, two modern-day warriors discover their greatest fear isn’t that of a madman’s revenge–but of laying their hearts on the line for love. Karlene will be giving away a digital copy of FALLOUT to one lucky commenter. Giveaway ends 10pm EST April 3rd. Please supply your email in the post. You may use spaces or full text for security. (ex. jsmith at gmail dot com) If you do not wish to supply your email, or have trouble posting, please email justromanticsuspense @ gmail.com with a subject title of JRS GIVEAWAY to be entered in the current giveaway. HI Cris! 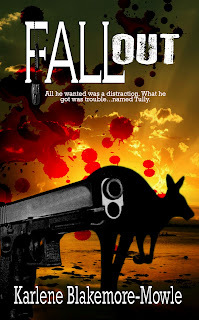 I was a little worried people would think the Kangaroo and the gun on the front cover would scare people off.. but rest assured no kangaroos were harmed in the making of this book! Hope you enjoy Fallout!! I don't know that I have ever read a romantic suspense set completely in another country but your book sounds very intriguing. I'm a Louisiana gal and I've read both of Karly's Operation Series books. The leading male characters are US Marines, so if you like the romantic suspense genre, you'll love her books!!! Another series that sounds great! Romantic Suspense has to be my favorite genre these days and I love those heros and heroines that serve and protect! I am looking forward to reading this series (regardless if I win this one or not). Thanks for telling me about a new series to look for, Karlene! HI Amy :) I love romantic suspense too... there's just something so unique about the characters in a rom sus- the way they meet, the way a relationship develops literally, on the run! You just don't get that in other genres. Thanks so much for dropping by and saying hi! look me up on face book I'd love to hear from you! Your cover does show the "Australian" flavour. It jumps right out. Hello Janet! It sure does. I'm really happy that both my American publisher and my American cover artist really made sure the cover reflected its Australian roots. Fallout is a stand alone book though, and not part of the Operation series. I am so happy I found this blog... enjoying finding new to me authors! Thank you for sharing, I will have to keep your books in mind! Hello Colleen, isn't it a fantastic blog site!? I have only recently discovered it as well and was so excited to be able to guest on here and meet so many new authors and readers!Thanks for stopping by! All these books sound very good. thanks for dropping in! Hope you enjoy the books!